Pause to express your thoughts of praise and worship to God. As you give thanks, let us remember to thank God for the Kalamazoo Gospel Mission and the generosity of Christians that care for the needs in our community. We are thankful for those who gave to the Above and Beyond at Northbridge to bless the expansion project of the Kalamazoo Gospel Mission. Today is Ashley Sheffer’s first day in Germany. 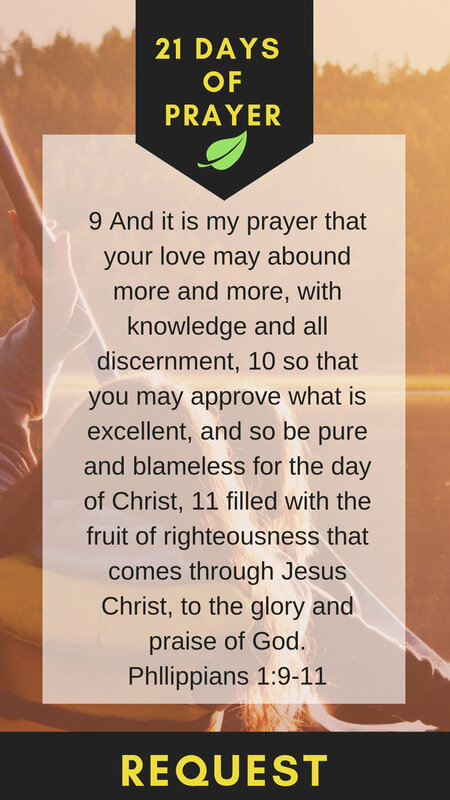 As you take 5 minutes to pray the following Scripture. let us pray for Ashley Sheffer, Rich and Julia Rudolph and Michael Landoll. Pause to pray that God will fill you, our church and our missionaries with his love so that it brings the lost to Jesus. Welcome to the 21 Days of Prayer! Each day we will pray the Scripture together for ONE thing. The prayer categories are Praise, Repent or Request and Thanksgiving. Pause to express your thoughts of praise and worship. God’s acquaintance is not made hurriedly.